The Global Water Leaders Group believes in bringing all participants of the sector together to create a better story for water. The Group partners with organisations that are motivated to drive performance in the water sector and that are interested in participating in the thought-leading and game-changing discussions that will change the face of water over the next decade. The CEOs of partner organisations are exclusively invited to sit alongside the champions of utility leadership to network, suggest and formulate solutions during the Group's major global events throughout the year. Click here to find out what it means to become a Partner of the Leaders! Network At The Top Level: Our CEO-level meetings bring together individuals who are interested in developing the water sector, discovering new technologies and undertaking projects. Here, you will build strong business relationships which may create opportunities in the near future and lay the foundations for the long term. Have The Opportunity To Shape The Industry: Not only will you meet some of the most influential thought leaders in the industry, but your opinions and ideas during the CEO-level workshops will help shape the discussions and lead to positive change throughout the sector. Partnering with this influential Group of CEOs will ensure your voice is heard. Expand Your Corporate Social Responsibility: Our mission is to create a better story for water, globally. Partnering with this group of public and private sector CEOs is an excellent way to exercise your organisation’s corporate social responsibility. You will be aligned with people who can make a real difference for the world’s most precious resource. Promote Your Message: Partnering with the GWLG will give you the opportunity to promote your company’s message to the entire sector across several platforms. Receive full-page advertising in the ultimate CEO's coffee table book - Water Leader magazine - which is distributed to around 2,500 CEOs and thought-leaders. You will also feature in online advertising on the GWLG website, as well as being included on signage at all Water Leader events. The Global Water Leaders Group is proud to have the support of FATHOM for the Global Water Leaders Dinner during the Global Water Summit 2015 in Athens. FATHOM'S CEO, Trevor Hill, gave a visionary speech about smart water development and technologies for the municipal sector worldwide, inspiring the leaders on to greater municipal performance. The Global Water Leaders Group is proud to collaborate with Metito in bringing about the inaugural African Global Water Leaders Meeting, taking place during the AfWA (African Water Association) Congress 2016. 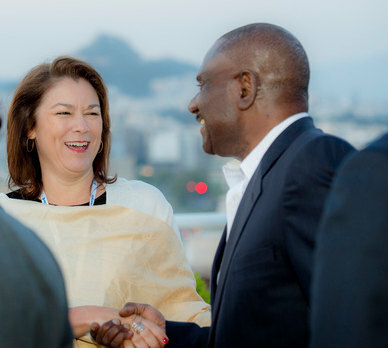 The meeting is known as the CEO Forum during the Congress, and will bring leaders from the water and sanitation sector from across the continent. Pedro Jorge, Metito Utilities Executive Director will represent Metito at the CEO Forum in order to work alongside the region’s water leaders to create a better story for water. The Global Water Leaders Group is delighted to announce that Suez Environnement will be the lead sponsor for the Global Water Leaders Dinner during the American Water Summit 2015 in Denver. We are looking forward to hearing Suez's latest insights into the trends and developments in the North American water sector and how they plan to develop the next generation of performance models to drive the sector forward. Global Water Intelligence (GWI) is proud to be the Publishing and Events Partner of the Global Water Leaders Group. GWI and the Group cooperate on several events throughout the year, incluing the Global Water Summit and the American Water Summit. GWI also has an outstanding reputation for publishing, providing in-depth market analysis and expert investment tips through their unparalleled network of contacts. The Global Water Leaders Group is proud to have ACWA Power as its Foundation Partner. By taking the lead in this role, ACWA Power is truly championing the private sector’s drive to put performance on the agenda for water, with real results.